Vision - the card spread analyzer! The playing card recognition system for a new era in card magic. 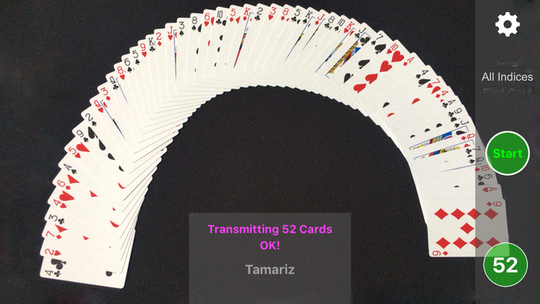 This is the main app which visually recognizes the playing card spread. It was always my dream to have a system which recognizes the order of a shuffled deck of cards. When I started the project, I thought that it would be ok if the processing of the card spread takes around a minute or so. While working on the project I was very happy to see how much power an iPhone has. By optimizing my algorithms, I achieved a computation time of a fraction of second for a complete card-spread, which to me is still amazing. For the detection to work, the cards must be spread in an arc on a black surface, with all indices fully visible. This system is intended to be used by magicians and only for entertaining purposes! This app provides tools and tricks, which make good use of the capabilities of Vision. This app contains several tools / tricks and will be enhanced over time. Currently I&apos;m working on several enhancements. It is great to see how much potential knowing the exact order of each playing card brings. The first set of features will be freely available, so you can enjoy your purchase of Vision even more! Contains a Stack Manager, which allows you to manage several stacks. More features are in development and will be added later.